But first I need to look more closely at that term “ourselves.” Does he mean, for example, to protect each person from other persons? I don’t think so. Judging from previous Paulian principles, in particular the very first (“Rights belong to individuals, not groups; they derive from our nature and can neither be granted nor taken away by government”), it would seem that Paul is using a sort of royal third person for individuals; by “ourselves,” he seems to mean to protect oneself from oneself. To many observers of this exchange, it looked as though the Tea Partiers in the audience were celebrating the idea of “tough toenails” to the hypothetical unfortunate. More likely they were celebrating the idea that someone was saying no on their behalf to laying out money for strangers who make poor choices without having to suffer the consequences. Paul and certain members of the Tea Party are indeed admirably consistent on this point, where many progressives certainly are not: what holds for the individual making bad healthcare decisions, on this view, also holds for corporate entities like banks making bad decisions with other people’s money. Progressives have no problem understanding the latter point. Many would stand right beside the Tea Party demanding that banks that got bitten by bad investment decisions before the financial crisis of 2008 ought to pay for their errors and not with taxpayer money. But the idea that an individual ought to pay for a bad healthcare decision just because they lucked out goes down a lot less easily. I include myself among those who make a distinction between corporate malfeasance and individual misfortune. I mean, the big banks were undertaking risky behavior with the full awareness that the government would never let them fail. In fine, they were (and remain) living in an artificially constructed risk-free world–constructed specifically for them by their friends in government. This is not the case with the individual whose economic choices (and political connections) are much more limited. Why would an ostensibly healthy young person decide not to pay hundreds of dollars a month to insure herself? Of course, she’s betting she won’t need it and can use the money saved elsewhere. She knows this is a risky bet, but she thinks the odds are in her favor. She certainly knows she could lose the bet in a big way, and she doesn’t expect to be bailed out. Such is life in the “free society” that is America in reality. The only difference between American reality and Paul’s vision, at least as far as principle 5 goes, is that in the latter case, banks are never too big to fail. It goes without saying that in Paul’s ideally free society, people are never too big or small to fail in a big way either. But I challenge the notion on behalf of individuals that such a society is optimally free. Is an individual truly free in society when a bad decision owing to bad luck locks her into evermore limited choices? In other words, is a society fully free if any one individual, through no fault of her own, is not fully free? It could be argued (as Paul implied) that a bad choice is the fault of the chooser, but what about the associations affected by that bad choice? What about the children dependent on someone who takes a risk and loses badly? What about other associates of the unfortunate who Paul thinks should be responsible for unlucky individuals just so government isn’t. Perhaps Paul believes, as Rep. Mick Mulvaney, whom I wrote about yesterday, believes, that some people’s extreme misfortune is the price the rest of us pay to be fortunate enough to be optimally free. That isn’t much of a price for a phenomenally fortunate person, though, is it? Let us escape these questions for now by imagining an alternative society where one of government’s agreed-upon (i.e., constitutional) roles is promotion of the general welfare–in other words, a society where government does protect citizens from their bad choices. In this society, people don’t purchase (or have their employers purchase out of their paychecks) private insurance for healthcare. Instead, some of their tax dollars are dedicated to a general fund that goes to paying all healthcare costs in the nation (i.e., a single-payer system). If you have extra money, you’re free to purchase private healthcare services outside the national system. But in this system, healthcare is considered a right, no matter how much money you have in your bank account. Are people in such a system less free than those in the Paulian universe? As I wrote in a previous post, “the person in the single-payer system may be able to make choices beyond what the one in the market scenario will be able to make, assuming they survive their respective hospital stays. The former individual will, at least, be free to think about actions other than paying for unpaid health bills.” Does this kind of freedom, available to everyone in the system, have a cost too high to be worthwhile? In Paul’s system, the alleged cost is the possibility of complete and utter ruination from bad choices. In the admittedly socialistic single-payer society, the cost is tax dollars that might have gone toward private insurance instead. Which would most people rather pay? Now if you ask this question in different parts of the country, or to people in different economic and social circumstances, you will, of course, get very different answers. 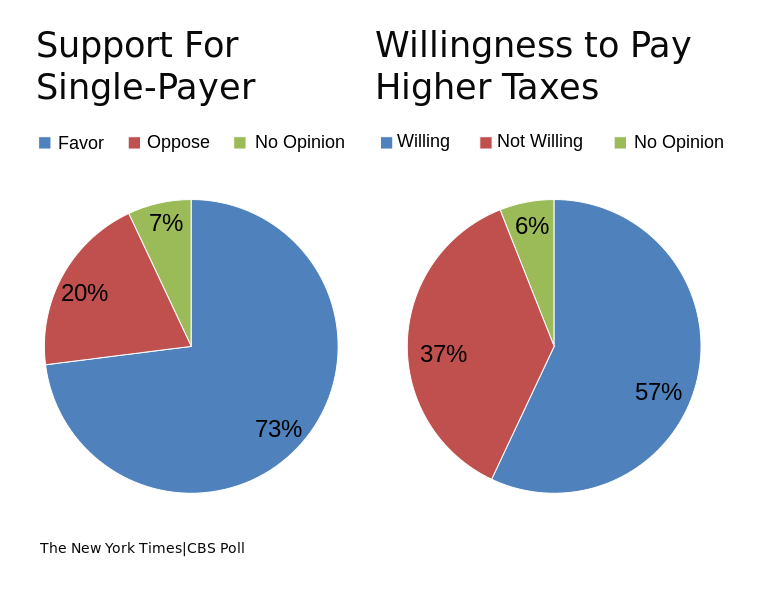 But as the pie charts at the start of this post show, a substantial majority of Americans apparently would give their consent to paying higher taxes in order to have a single-payer system. I would love to hear from Paul or one of his supporters a reason why, if people are freely willing to pay more taxes to have the government look out for their healthcare interests, anyway, it isn’t contrary to the principles of a free society to oppose them. This entry was posted in Books, Democracy, Economics, Politics, Society, The Ten Principles of a Free Society and tagged Free society, government, Ron Paul, Tea Party. Bookmark the permalink.